One of the most frustrating parts of potty training? Regression. After weeks of ablutions (army slang, blame my dad) in the correct places, nap time followed by awakening with bone dry pants. So it's extremely frustrating to take ten steps forwards and eleven steps back. My little one, Albie, now 3, had been in pants for weeks, I was really proud of his progress, despite various setbacks. But as a whole we'd got some great teamwork going on. Me: Need a wee, Albs? Every day at pre-school he's absolutely fine, and regularly toiletted - so no problems there. Happily immersed in his new mini Thomas motorised train set, I asked him a few times if he needed a wee. I watched the pattern of him grabbing his 'ding' (his bits) and hopping from one leg to the other, so the 'nope' clearly contradicted the answer. I ensured the potty was right by his feet ready for the deluge, and carried on with dinner. Generally if someone tells me no, they're ok - I'll take their word for it. Two minutes later, I heard a huge howl, and a familiar tinkling noise. His earlier statement was fallacious. Albie was obviously overwhelmed and ashamed by his accident on my very expensive cow hide rug (can I just point out this has now had pen, vomit, poo, urine and a variety of food items all over it) and he was in tears. I won't deny, I felt really peed off (scuse the pun) and Usain bolted with the closest kitchen roll to mop up the what seemed to be the never ending pool of urine. 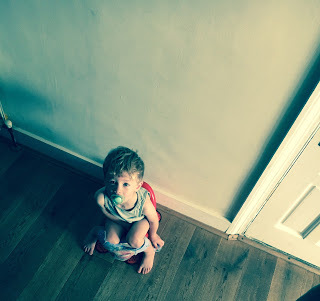 Take into consideration any of the above points, I won't bore you to tears with the culprit to ours (no 7, if you must know and please refer back to our other potty training posts). Although this time, I'd like to think Albie was just so absorbed with his trains he just simply didn't want to miss out on anything. The Huggies® website recommend going back to basics as the best way to overcome a period of regression. If you team with plenty of support and praise when appropriate, revert to your earlier routine of regular potty use and marking progress together on a reward chart. Remind your little one to go to the potty when they're busy playing and look out for signs that they need a wee. If the accidents go on for more than a few days, or if it's upsetting your child, going back to Huggies® Pull-Ups® for a while can also help. That happened to my little one. It turned out that we had made a couple of DIY changes in the bathroom that were a little distracting. Th usual step to reach the toilet was on th otherside of the basin. small changes big difference to them!